Like many peoples of Acre, the Puyanawa suffered heavily from the boom in rubber and caucho extraction in the region at the beginning of the 20th century. Since the first contacts with non-Indians, many have died in direct confrontations or from diseases contracted during the colonization process. The survivors were forced to work in the rubber extraction areas – the seringais – and quickly found their way of life decimated due to the methods used by the ‘rubber barons’ to keep the Indians working under their yoke. The Puyanawa were expelled from the lands, missionized and education in schools that banned any expression of any trace of their culture. It was only with the beginning of the process of demarcating their territory that Puyanawa culture was once again valued by the Indians themselves, who have worked hard to recuperate their native language, a difficulty task given the small number of speakers left. 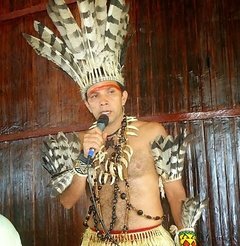 We are Luiz Puwé Puyanawá and Vari Sharanayá Puyanawá, and we belong to the Puyanawá tribe. We live in a town located in the northeast of Brazil, in the State of Acre in the Brazilian Amazon, Cruzeiro du Sul - Mancio Lima Municipality. We are asking for collaboration from all of you, to make our town’s dream come true - which is to have our songs recorded on a double CD which includes traditional ceremonial songs, passed down by our ancestors over generations, and another CD containing songs which were inspired more recently and which feature professional musicians. This project tries to make the recording, mixes, mastering and manufacture of the first disc of the Puyanawá ethnic group viable. It is the first time that our town has collaborated in a project of this type. Our mission is aimed at recovering and safeguarding our musical and cultural traditions, with the intention of spreading our songs to try to heal our mother Earth, for the benefit for all the habitats of the planet. We are particularly thankful for the initiative of this trip and the viability of this project, and to the associations. Thanks to your contribution, we will have our music professionally recorded, and we will be able to share our songs with anyone in the world. We propose other alternatives of participation too. You can collaborate on the editing of the CD, buy our crafts, you can share an ancestral song and healing ceremony with us, and also you can visit us in our village to take part in some of the festivals that we have during the year.